The painting used on our label is called, Canoes in a Fog, Lake Superior. The piece was done by Canadian artist, Frances Anne Hopkins (1838 – 1919). Below is some context and interpretation for the painting. While Hopkins was in England she worked on her sketches and memories of Canada in a studio where the majority of her paintings were in oil and watercolour. Hopkins experiences were documented in sketchbooks at the time of her travels and are the major subject of her paintings. Canoes in a Fog, Lake Superior is a beautiful painting and is an image of tranquillity in the backwoods of nature, as the Canoes disappear into the fog. Hopkins combines realistic clear detail with a lyrical passionate style inspired by her love of nature. Hopkins painted herself and her husband in the center of the nearest canoe and she is holding a sketchbook in Canoes in a Fog, Lake Superior. She placed herself in the painting to represent a memory of when she was in that canoe on Lake Superior. Hopkins had chosen the viewpoint of the canoe as if she was traveling behind in another Canoe (possible the canoe could mean traveling along her past experiences). Canoes in a Fog, Lake Superior by Hopkins presents three North canoes entering the mist. North canoes were used by fur traders and were about twenty-five feet long and had a crew of eight or nine. Frances Anne Hopkins contribution to Canadian history was accurately capturing on canvas the country’s first major cargo transportation system and the type of people who traveled on it. Her work is described as a historical illustration rather than high art. Hopkins skillfully captured a practice of transporting pelts by canoe which was being replaced by the industrial railways. Many contemporary critics find the painting interesting because of the canoes used were the types of canoes used in the original fur trading. Canoes in a Fog, Lake Superior portrays three canoes drifting in a diagonal line away from the observer. The ripples in the water behind the canoe suggest that the canoe is moving through the still water. The fog and surrounding water of Lake Superior seems to be absorbing the canoes as to represent an adventure into the unknown. The two canoes ahead have disappeared and the third canoe has a portion of it disappearing as it enters into the mist. 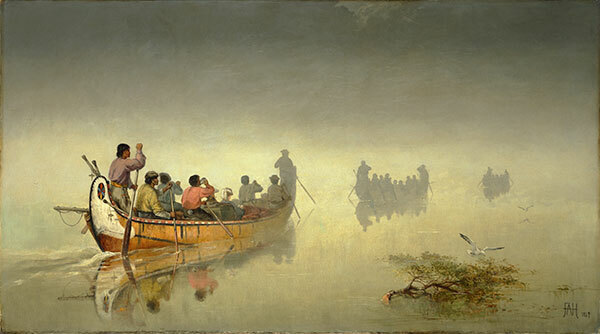 In the summer, fog is common along the north and east shores of the lake and the fog dissolves in the morning sunlight (allowing more realism to Hopkins painting).